“Hey, Dad! Let’s take a little walk around the house! After seeing the fun printed burlap ribbon available at Hobby Lobby, I decided to celebrate the Best Dad Ever with this wreath – a little more masculine than the ones I created a couple months ago that are found here – but the same principle applies. Tie wired ribbon around a $5.00 grapevine wreath and add a phrase or sign or some kind of ornament to fit whatever season you are celebrating, and you’re done. 2″ wide ribbon seems to work the best but for this wreath but Hobby Lobby only had one roll of a couple of the ribbons I really wanted to use. Instead of wrapping it completely around the wreath and tying it in a bow, I opted to make loops with the ribbon, tie them off with wire, then attach the pseudo-bows to the wreath with wire. I was able to get almost double the number of bows when I did it that way. They don’t cover the grapevine wreath if you don’t tie the ribbon around but this is a great way to incorporate low-quantity ribbon into more places on your wreath. If you put these wired loops next to fully-tied ribbon sections on your wreath, you can fluff it and manipulate the loops to not show the wire. Can you tell which ribbons I did that with? Coleman helped me paint the board for the quote and I used outdoor vinyl to cut this phrase before attaching it to the board. Find it here at my Silhouette store (shape #61557). Remember, all Silhouette files are only meant to be used on your Silhouette die-cutting machines. They cannot be used (even for printing) if you don’t have the software! After the vinyl was applied, I sprayed the entire board with glossy varnish to seal it and give it some shine. My friend saw our Father’s Day wreath and wanted a 4th of July wreath for her door. Same burlap ribbon technique – this one took about 2 hours to complete, start to finish, and the wooden phrase was at Hobby Lobby for 40% off. I removed the hanging wire from the phrase and tied it onto the wreath with ribbon. Celebrate the Best Dad Ever in your life. Enjoy! My husband, Jason broke his neck when he was 15 years old. About a year into his new life he came to a crossroads where he needed to find a way to take his hope in his future life to the next level. He pulled out a piece of paper and numbered it from 1-100 and started writing down the things he was grateful for. The first 25 were easy – food, family, a home, a bed, friends, etc. The next 25 were also pretty easy but more specific. The third 25 started getting difficult for this teenager to think of. 76-100 were a test, indeed. He was thankful for ketchup, lightbulbs and and the posters on his wall. If he could see it then he wrote it down. It’s been about 27 years since that first Gratitude List was created in the bedroom of a 16-year-old. Many Gratitude Lists have been created since in the Hall house. I go through this process on a regular basis. It has taken different forms over the years – I’ve made lists of 1-100. I’ve kept Gratitude Journals like these for a year at a time. My first Project Life album was dedicated to finding something I was grateful for each day and taking a photo of it. Click on my “Project 365 of Gratitude” category for past posts about this project or look at this post or this post or this post to see why I love using Project Life as a gratitude journal. I believe gratitude is the most powerful weapon in our arsenal in the battle against discouragement, negativity, heartbreak, depression and every life challenge that we can face. It is a life skill that takes practice in order to become strong. As a habit, it straightens our spines, clears our minds and opens our hearts to hope. Simply said, gratitude overcomes negativity and creates joy. Take a moment this holiday season to write down what you are thankful for. Make a list of 1-100. Your children can be very successful at this activity as well, even if you break it up into multiple sittings. Post your list somewhere that you can look at often to remind you of your blessings. Big things, small things – include them all on your list. Mine had Reese’s Peanut Butter Cups and Bettona Pants from Athleta. When we choose to be grateful for things like that, it’s easy to be grateful all day. 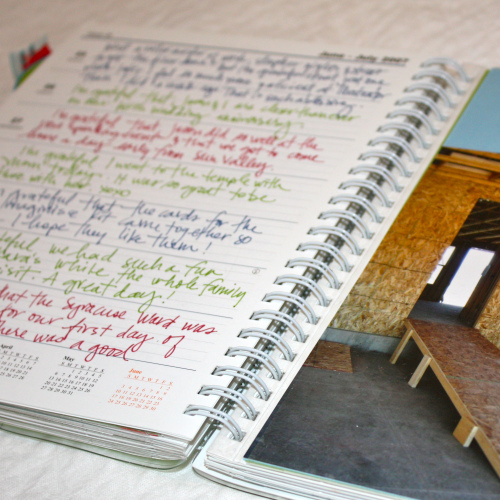 Another way to do it is to write down something you are grateful for each day for a month. See how it changes your heart, your attitude, your outlook on daily life, and how you interact with others. 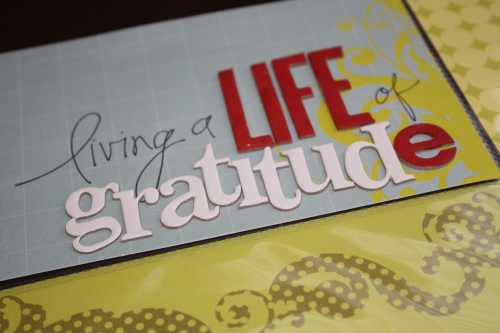 I’ve added some shapes to my Silhouette store that will help you with your gratitude lists. I hope you enjoy them! Uggghhh! Jason is back in the hospital for the same sore he has been dealing with all year. After a third surgery (muscle flap and skin flap) and 10 weeks in the hospital, we thought he was coming home. But his wound suddenly got terribly worse and now are back to square one. It looks like it’ll be another surgery and another eight weeks before we get to be together full time as a family. So, we’ll have to settle for face time calls and hospital visits like this one where Coleman is attempting a record-length smooch on Dad’s head. It was long and full of giggles….the visit and the kiss. The hospital is where have I been since I haven’t been on my blog. Bummer! And to top it off, Coleman figured out how to pronounce the word “hospital” correctly today. Double bummer! I love it when he speaks the way that he hears things and verbalizes words the “4-year-old way”. Coleman is a great communicator but up until today, hospital has been pronounced “hos-ti-ble” and it always made us smile. I would have been happy with him pronouncing it like that forever. It is just a tiny manifestation that our little guy is growing up, learning and experiencing life faster than we want him to. Parenting is a funny thing – we want our children to grow and become independent and move forward but at the same time we want them to stay right where they are forever. I’ve been feeling those opposite pulls a lot lately when, as an early-bird, Coleman snuggles his little body next to mine at 5:30 in the morning. Or when he holds my hand as we walk into the grocery store. When he calls me, “Mama” or believes that the lavender “Bye Bye Scarys” spray really works to keep the monsters away at night. I know that the more he grows into himself, the more he will grow away from me. I want it, but I don’t at the same time. Being a mom is tough and wonderful work, that’s for sure. Along with visits to the pumpkin patch and picking out the perfect ones for our “jacky-lanterns,” this is a great time of year to be in my line of work. I think I have created hundreds of Halloween and thousands of Christmas designs for various products over the years. I love designing for this season and my Silhouette store is bursting with all kinds of Halloween quotes, words and shapes for any project. Whether you have independent children in your life or not, enjoy this time of year with it’s ideas and projects and fun for any age. Hang on to those memories and moments and embrace whatever stage your family is in right now. Happy spooky cutting! It’s project season everyone! Jason is an amazing father. The time and energy he spends being a dad is exactly what I would choose for my son. Now that Coleman can get in and out of his booster seat in the car, they can go just about anywhere together. There are very few days when Jason does not take Coleman with him to run errands or go on an outing to the Dollar Store, Cherry Berry Yogurt, to play at a fast food playplace, or anything else they can dream up. They work out the logistics of a successful day together. With physical challenges that would give any father opportunities for excuses and giving up, Jason is a hero in every sense of the word. Father’s Day is only a few days away. Here is a vinyl quote for the perfect Dad Project. Personally, I think it would look fabulous using the chalkboard tutorial found here. The quote comes with both son and daughter as well as individual versions. It fits any family. Head on over to my Silhouette store to get the vinyl quote shape. I want Coleman to love things. To love life. To love friends. To love family. To love reading. To love soccer or lacrosse or chess or whatever activity he chooses. Jason is a very loyal, passionate person. He is a super fan of so many things, including Cole and I. I want Coleman to feel that same passion for whatever he chooses to do in his life. Including his faith. There is so much good in the world. So many good people who believe in doing good and being good. I am grateful for the opportunity to rub shoulders and be friends with people of all faiths and beliefs. But I think I’m not alone when, as a parent, I want my child to feel as strongly about his faith as I do. I want him to be proud to believe in things of the spirit. I want him to know it for himself and by knowing it, choose to live it. I want him to love it. I think I want this for the simple reason that I know life is challenging. My faith has guided me, strengthened me, and given me peace during dark, difficult times. I would love for my son to feel that same sense of strength throughout his life as he faces the natural twists and turns, ups and downs that our journey takes. I’m sure these thoughts are on my mind right now because Jason is back in the hospital for an 8-week stay. He just finished 6 weeks in the hospital this fall from surgery on a bone that was causing chronic bedsores. Unfortunately, that surgery didn’t heal properly so the surgeon had to go back in a second time. We had a fabulous holiday with our families and after two weeks of cousins and food and laughter and fun, we left grandma’s house to drop Jason off at the hospital while Cole and I headed home. Surgery was two weeks ago (two weeks down – hooray!) and Jason is actually doing amazingly well as he is required to lay on the fancy no-pressure sand bed to heal. Life brings challenges. Adversity is around the corner. Faith doesn’t solve the problem or take it away but it helps us manage our struggles. And sometimes that’s all we need. Here’s to faith – whatever yours is, wherever it’s found. May you find hope and peace and courage to help you work through anything life throws you. For those of you out there who loved Ann Dibb’s talk about being a Mormon, here’s her quotable quote from that lovely talk. Free Printable….Yes! I can see this in our Activity Days future. Sometimes I think my life is hard. Like last night when I was running to the bathroom to throw up because of food poisoning and Cole was crying in the kitchen because he thought it was a race and I had left him in the dust. Or lots of times when I have to fix a “quadriplegic emergency” – which actually could be anything from nursing a bedsore to running to the garage because Jason has gotten stuck on the ramp. I don’t know what it is like to deal with many of the trials and challenges that people face in this world. But I do know what it’s like to live with someone in a wheelchair. And while our lives are rich beyond measure, there are still hard things. No matter what adversity you might face or what joys you experience, there are still hard things. But I am so grateful today. Not for the food poisoning. Not for the “quadriplegic emergencies.” Not for the three-year-old always wanting to “win” whatever competition he is participating in. I’m grateful for you. For your stories. For your moments of strength that beat out the moments of struggle. The smiles in spite of the circumstances. The life lived well – or as best as you can live it at the moment. The picture of the jar of butterflies that I used in my last post came from this etsy shop. I used it simply because I liked the picture for what I was trying to say about my One Little Word. Today, I still like it. I like it so much that I just bought those little butterflies. And I can’t wait to receive 100 butterflies in my mailbox. I know. Now you want some, too. Lucky me. Life isn’t so hard after all. Life with a quadriplegic is interesting. It requires constant adjustment to things that many people naturally don’t have to think about. Shoes have to be pushed out of the pathway if they hope to survive not being run over by a wheelchair. Necessary items like a pen or checkbook or bottle of water are kept on top of the desk or counter within easy reach. If not, I spend half my day fetching items. It might be easy for the rest of us to just grab our laptop while we lounge in bed in the evenings but for Jason, it’s virtually impossible without help. An iPad gives Jason all kinds of lightweight, easy-access, technical freedom that he has never had before. We designed our home so that he could park his van on the correct side to access the ramp going into the house from his automatic doorway. Our bathroom sink was specifically built for Jason to fit underneath it while looking beautiful at the same time. The handles on all of our doors are levered – perfect for someone who can’t use his hands. We have lots of open space, few walls and minimum hallways to allow the wheelchair to get around effectively. To someone visiting, our home looks very normal and one in which any family would feel comfortable – but we have thought about every corner, every counter height, placement of each piece of furniture and accessory, the width of every door, a plan for every traffic path. Every nook and cranny was analyzed and planned for according to the lifestyle of functioning with a quadriplegic in our family. I prefer to help Jason to be as independent as possible, which in turn frees me up as well. It’s a win-win situation for sure. All of these adjustments and modifications are second-nature to me now. I walk through the house tidying up as I go, moving this toy so Jason can get to his office door, shifting that pair of shoes so he can reach the light switch, sliding the pile of mail closer to the edge of the counter so he can reach it. Making things accessible. That’s one of my jobs. I think about this idea of accessibility in relationships as well. For about the first three months of my illness I was in survival mode. I fell asleep about every 30 minutes. I stared at the walls, unable to even focus on watching television. A few sentences made up conversations but mostly on the part of the other people around me. Because of this, Jason was very protective of me and asked friends and neighbors not to visit. I simply couldn’t handle it. As the months passed, I found that I was able to start adding things back into my life again. This included relationships. In fact, I used relationships as a tool for healing. When friends asked what they could do to help, we scheduled a time for them to come visit. I needed company to help distract me from the pain that has been a constant companion since May 1. Then I got to the point where I could participate more in life and needed activities to do. Cole and I spent our mornings having “play dates” with other moms who have toddlers. And even though I have made a great deal of progress and can do more and more each month, I still try to keep these play dates with as many friends as possible. It has been a great activity for Cole but an even better one for me. After being deprived of the ability to pay attention to others, I have learned even more about of the necessity of being accessible in order to nurture relationships. Creating friendships takes time. It takes effort. It’s hard work to focus on someone else and make your relationship with them meaningful. I have had many blessings and learning opportunities from being sick like this but one of my favorite blessings is the opportunity I have had to develop the foundation of friendship with women around me. I better understand the value of making myself accessible to others and inviting them into my life. So as I walk through my life with Jason, sweeping shoes and toys out of his way, I am reminded of doing the same for friends and family. Making myself accessible. Pushing aside my fears of opening up and creating a clear path toward relationships that are tied at the heart. A little work goes a long way.